Syndicate Bank has released scorecard/ marks details/ marks obtained by the unsuccessful candidates in PGD Exam 2014 which was conducted for getting admissions to one year Post Graduate Diploma in Banking and Finance (PGD in B&F course) in Manipal Global Education Services Pvt Ltd, Bangalore (MaGE) and Nitte Education International Pvt Ltd., Greater Noida (NEIPL). A huge number of candidates had appeared in the written examination. The result of written examination was released on 14th January 2015 and many got successful and unsuccessful in this written examination. Those candidates who got unsuccessful can check their score which was released on the official website of Syndicate Bank. These candidates can their performance section wise in written examination and can improve their preparation accordingly. The successful candidates can reprint their application form. The link for reprint application form is activated on 06th February 2015 on the official website of Syndicate Bank. The application print is required to attend the interview schedule which will be conducted from 09 February 2015 to 11 February 2015. This is one of the mandatory documents required for interview. Candidates are advised to take print out the application form and take it in the list of documents required for interview. Enter Roll No. and Date of Birth of the candidate. Enter the text provided on the screen in upper case letters. Download the scorecard in PDF which will appear on the screen. Save or Print the scorecard to improve performance in future. Syndicate Bank Exam was conducted on 27th December 2014. The Syndicate Bank Exam was conducted by ONLINE MODE. The exam was entertained through filling of circles on Computer Generated Page containing answers by clicking by mouse on it. There was no OMR sheet needed to be filled by Blue/Black ball point pen. The exam consists of various sections English, Reasoning, Quantitative Aptitude, General Awareness and computer Intelligence. The exam was a multiple choice question paper of 200 questions of 200 marks and five options were provided out of which candidates need to choose one correct answer. The time duration was of 2 hours or 120 minutes. 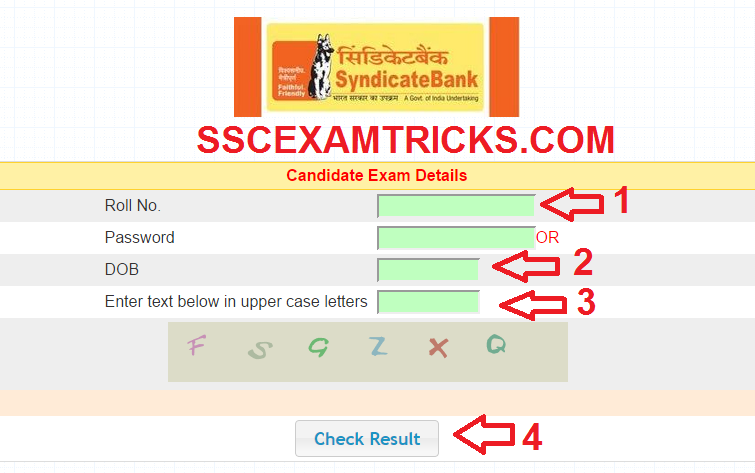 For more information candidate must download syllabus and exam pattern of Syndicate Bank exam from the official website.